Independence Day is almost here! The 4th of July is definitely one of my favorite holidays. 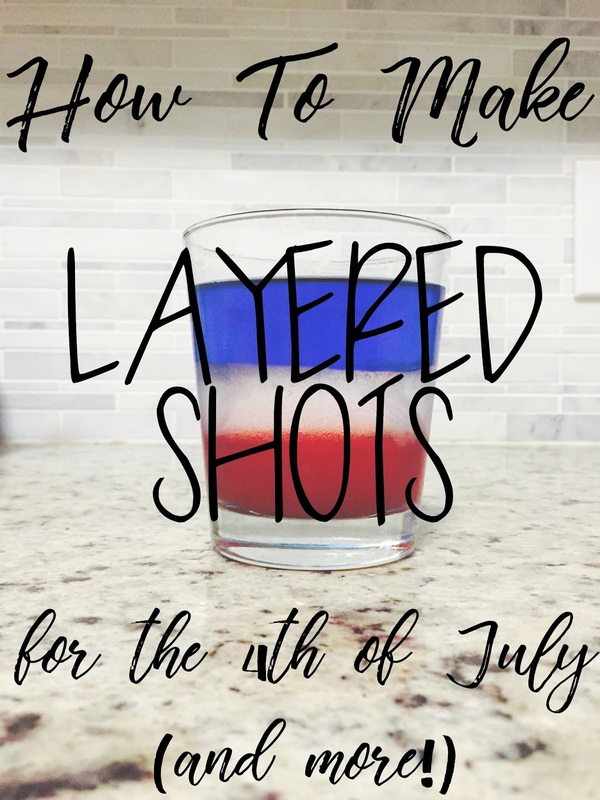 And what better way to celebrate than with red, white, and blue layered shots? 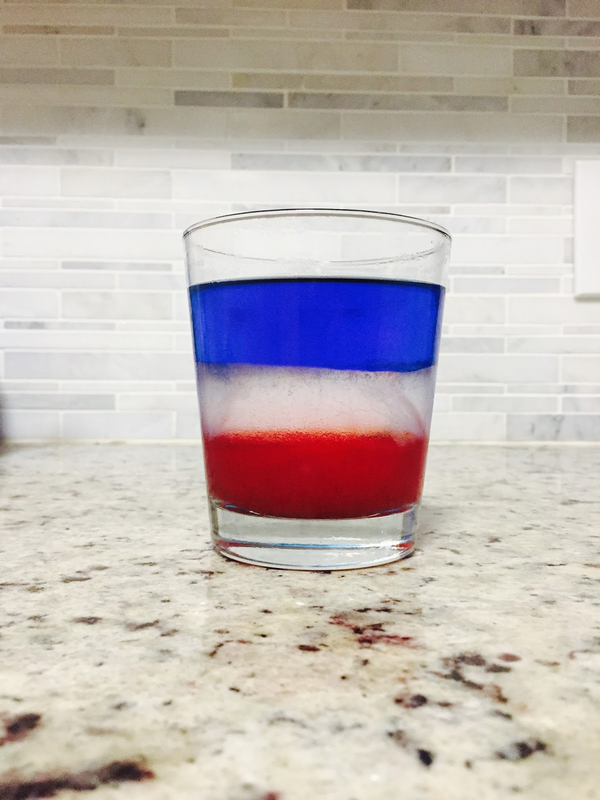 And I don't mean layered like the jello shots I did for the last 4th of July. Those don't need a tutorial, you wait til one layer is solid and then put the next one in. Easy. No, this layering just the booze without the solidity of jello to help you. Which is harder but the results are worth it. I'm not going to lie - making layered shots isn't easy and it takes practice. It's all about mastering the slow, controlled pour. 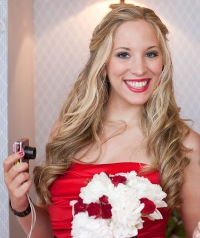 But once you get it, they end up so stinking pretty! Before we get to the pour though, let's talk about density, because that's how you know which liquids will layer and which will just mix together. Your three liquors (or liquor and a mixer, like orange juice) need to have distinct densities, which is just a measure of how much sugar versus alcohol there is, with water being a density of 1. The more sugar there is, the higher the density, and the more likely it will sink to the bottom. Something syrupy like the grenadine has high sugar content (it's 1.18) and would be a good bottom layer. Conversely, something with a high alcohol content and low sugar, like Everclear (it's 0.84) makes a good top layer, because it's not not going to sink into more dense liquors. This is why you can't simply take vodka and dye it 3 different colors - the layers would never stay. There's actually guides on the internet that will tell you exactly what the density of popular liquors is, and you can sort of tell based on the alcohol percentage listed right on the bottle. Or you can just practice based on your best guess. Now then, the pour. Each pour needs to be slow, with no splashing. For the bottom layer, your most dense liquor goes in. Get it directly in the middle, without splashing any up on the sides of the glass. For the second layer, put a spoon upside down in the glass, holding the tip just above the first layer and pressed against the side of the glass. Slowly pour in your next liquor, letting it gently hit the spoon and trickle down. Don't pour it directly from the bottle, it'll come out too fast. Instead, pour it from a smaller container that you have more control over. Should you have a syringe you use to give your kid or dog medicine, or small tipped baster, now would be an ideal time to bust it out! Repeat this for the top layer. Use a clean spoon or really wash the first one off well, it can't have any of the residue of the last liquor. If the layers mix a little, they'll separate more if you let it sit for awhile. But if they get totally mixed up, they won't separate so don't bother waiting - you'd need to start over. Once you master this, you can change up the liquors to match any holiday. Trust me, start with your least common color liquor when deciding - blue is a tougher one to find and you can base the other two ingredients off the density of your first choice. For this particular recipe, the bottom layer is grenadine, the middle layer is peach schnapps, and the top layer is blue curaçao. You have all weekend to practice! And the mistakes along the way will taste juuuust fine.